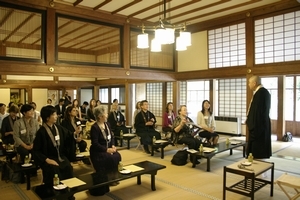 International Ladies Association of Buddhism (ILAB) aims at offering opportunities for Buddhist and Non-Buddhist females who have interest in Buddhism to get together, exchange their views, cultures and traditions to deepen our understanding on Buddhism to apply it in our daily-lives to serve for the welfare of the society. 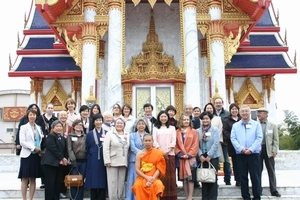 For our spring outing, we went to the Thai temple "Wat Paknam" in Narita city. This is a Japanese branch of Wat Paknam temple in Thailand. For our autumnal outing, we went to the renowned Rinnoji Temple in Nikko. This temple is a part of the Nikko UNESCO world heritage temples and shrines. "How can we overcome prejudice?"